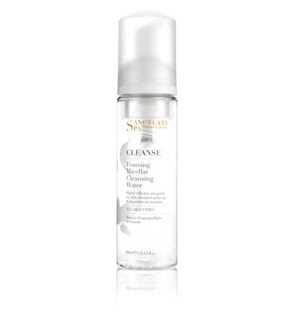 Hands up who hasn't tried micellar water yet? Are you falling asleep with your make-up on? Is your skin often dry? Can you be arsed to cleanse and tone? Do you know how drying and bad some face wipes are for the skin? If you answered yes to more than two of those - listen up! Micellar water should be a staple in any mums beauty routine, simply because it's the laziest and easiest way to cleanse and leaves skin supple and squeaky clean. The teeny micelle molecules in the water use a clever technology to attract the dirt (a bit like a magnet) which then lifts away make-up and grime - and there's no need to rinse. Simply soak your cotton wool in a reasonable amount, and with one deft swoop you've removed the grime of the day and can collapse in bed. The Sanctuary (of Spa fame) are SO confident about their new micellar product, they're offering customers the chance to bring in an old pack of wipes to swap for a sample of their Cleanse Foaming Micellar Water - FOR FREE! This is only on the weekend of 19-20th MARCH in BOOTS stores nationwide. So get down there armed with your wipes and a smile.